It’s no secret that I’m a huge fan of social media as a tool for learning. In order to stay on top of the various conversations that I like to follow, I have a number of lists that I have created. These various streams sometimes lead me to inappropriate posts by students. These instances concern me as to the amount of guidance that these students are being given in regards to the things that they post online and the possible ramifications. As an educator, I feel it is the job of all of us to support students and ensure that they are fully aware of the implications of their online activities. Therefore, when I saw the tweet above from a local student-athlete, I decided to send the e-mail below to his Principal. I encourage others to take similar actions when they see this type of behavior. (I have removed the name of the student and the school because the truth of the matter is these things are happening at all of our schools). I wanted to ask you to please have a conversation with Student Name about his use of Twitter. I stumbled across it while looking for some local high school basketball scores last night. While I do not think most student profanity on Twitter or other social media is a school issue, I have a concern for students who say things in this forum who may fail to understand the implications. As a former high school Principal and a current Assistant Superintendent, I am a big advocate of social media use and I continue to push for the constructive use of social media by all members of a school community. My concern is that I do not want to see students lose out on opportunities due to comments they make on Twitter or anywhere else on social media. At one point when I was a high school Principal, I pulled all of my juniors and seniors into the auditorium and shared some of the comments that I had seen them using and talked about the ramifications with them in regards to the question on the top of the slide below. I worry that someone would make a judgement about the type of person one of our students is because of a single social media post. However, the fact of the matter is that this might be the only evidence of social interaction from that individual to which a school or employer has access and when there is a pile of other applicants it is easier to move to the next option. In addition, The New York Times article They Loved Your G.P.A. And Then They Saw Your Tweets highlighted the fact that some college admissions offices check the activity of students Just this week, USA Today had an article titled One Bad Tweet Can Be Costly To A Student Athlete. While I know most student-athletes aren’t concerned about scholarships, they should know that employers and college admissions offices actively check social media accounts of applicants and make decisions based on what they find. In most cases, a quick Google search by a students using their name + Twitter would quickly bring you to their account information. I was going to tweet to Student Name directly, but I did not want to bring attention to this. I have little doubt that he is a fine representation of a student-athlete at your school and I hope he will consider cleaning up his social media accounts. While I don’t condone the use of profanity and such, I remember being a high school student and the fact that many of these same conversations and comments were common in the locker room or hanging out with friends or teammates. My concern is that now many of our students are having these conversations online without a full awareness of how public they are. Anyway, sorry for the long e-mail. I wish you the best during the remainder of the school year and trust that this will not be a disciplinary matter but just a “teachable moment.” Good luck to Student Name and the team for the rest of the year! Another great post! This type of conversation should be ongoing with students. There have been times when I have seen posts that have made me uncomfortable but I have not been clear on the best direction to take with students. 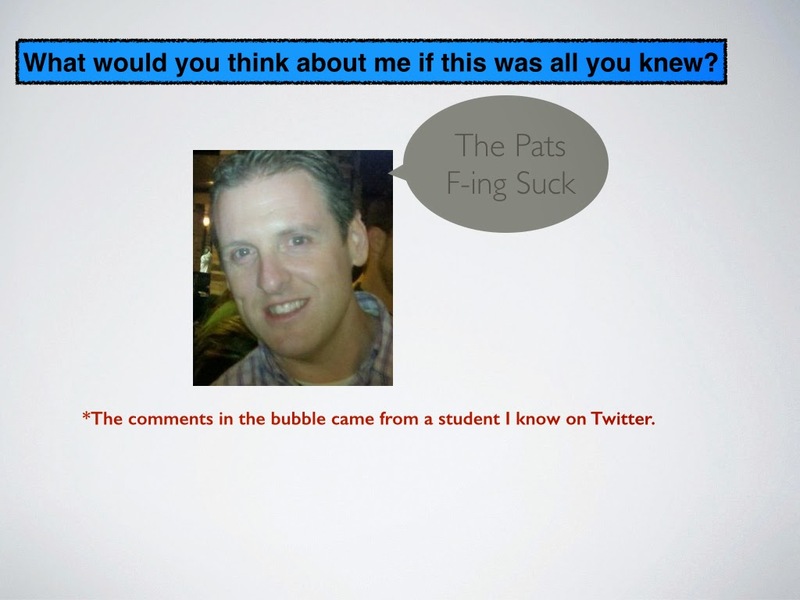 I do remind students that everyone can view/see what they are posting and they should keep user profiles private. I recently had someone from the district attorneys office present on the legal issues around inappropriate posting and texting. Students asked about the best way to clean up old post when they heard about the consequences associated with posts. Thanks for the post!